The National Museum of the Romanian Peasant was founded (under a different name) in 1906, after departing of all the ethnological collections, from the original Museum of Antiquities (founded in 1864). Designed, initially, as a museum of arts et métiers (in the French cultural tradition), the museum has evolved in a modern museum of cultural anthropology, being interested in all the aspects of the traditional and modern life, inside the traditional and contemporary communities from Romania. The Museum researches and collects traditional and contemporary objects of everyday life, being interested in the significance these objects have in the Romanian society in the last three centuries. It is a museum for which the tangible and intangible heritage is equally important; it is a museum which preserves historical monuments in situ and a huge collection of moveable cultural items and archives from all over the country, from the Romanian ethnic communities living abroad and even from some other civilisations. 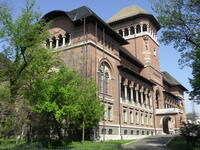 However, the museum is famous in Romania (and in the whole Europe, after being rewarded, in 1996, with the European Museum of the Year Award) for its permanent exhibition (which treats the objects in a contemporary artistic manner) and for the non-conformist activities on cultural, educational and social fields. It is, also, famous, all over Romania, for its rich public agenda, involving a wide range of public. The museum was, also, awarded with many other Romanian prizes and international acknowledge for its highly appreciated cultural activities and social involvement.